A lacquered wood box and cover of hexagonal form, supported on a high, straight foot, the cover with domed sides and a flat top. The black lacquered exterior of the box is inlaid with small pieces of mother-of-pearl. The flat top is decorated with two figures in a landscape setting. A literati, seated on the edge of a lake, is looking at the wavy flow whilst his attendant stands by his side under a tree. A jagged rock formation can be seen in the far distance. The sides of the cover are decorated with floral sprigs, with different flower branches to the sides of the base section, between bands of formal diaper pattern. The interior is covered in bright vermillion lacquer. The Ryukyu Islands held close connections with China during the Ming dynasty, but from the early 17th century were closer to Japan. 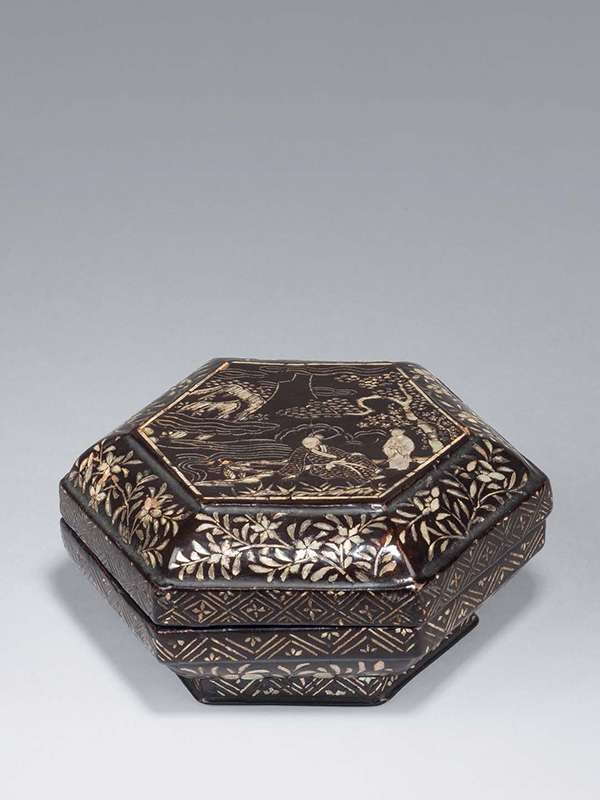 Although much controversy remains over the attribution of certain lacquer pieces to either China or the Ryukyus, the shape of the present box and its decorative scheme strongly suggest an attribution to Ryukyu manufacture. In the early 17th century a new mother-of-pearl inlay technique was introduced to Ryukyu craftsmen from China, which involved boiling the molluscs and peeling off very thin layers, resulting in an increased iridescence when pieces were inlaid in lacquer. 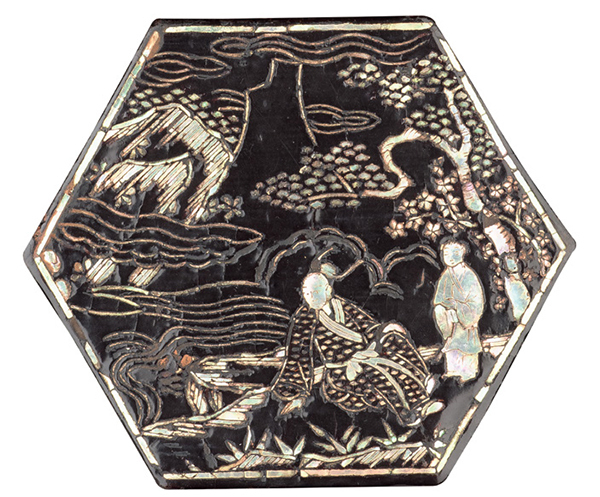 Hexagonal lacquer boxes were common products in Ryukyu; a stacked hexagonal box now preserved in the Museum für Kunsthandwerk in Frankfurt-am-Main, is decorated with a closely comparable scene of figures in a landscape setting. There are, however, also parallels with Chinese lacquer of this period, such as a circular box in the Nezu Museum in Japan, which also shows a figure sitting beside a river, accompanied by an attendant.